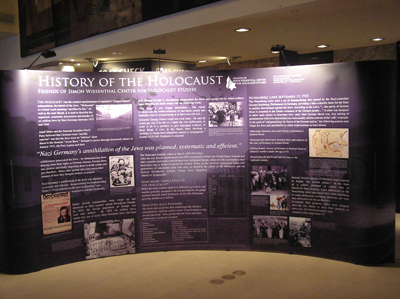 Friends of Simon Wiesenthal Center for Holocaust Studies is in the process of launching a series of educational exhibits, designed to stimulate thought and provide social commentary around issues relevant to our mission. These 4 exhibits are portable and easily assembled, measuring 12.5 feet in width by 7 in height, and are slightly curved. Additionally, the 4 exhibit walls can be combined to form two semicircles, with an approximate 25’ diameter. 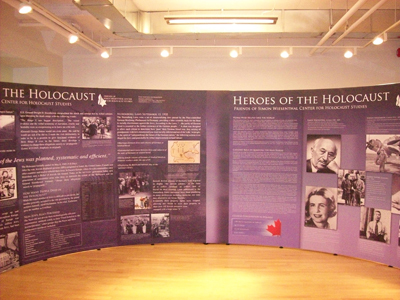 Lighting is supplied for each exhibit. Thematically, the first two walls concern the Holocaust itself, both its sordid history and some key figures who responded to the darkness in Europe with selfless heroism. 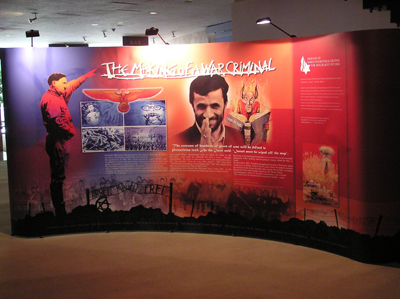 The second two profile renowned and contemporary champions for human rights, as well as the very opposite, the modern war criminal - a comparison of Iran’s Mahmoud Ahmadinejad to Adolf Hitler. Registration forms may be downloaded in either Word or pdf format. 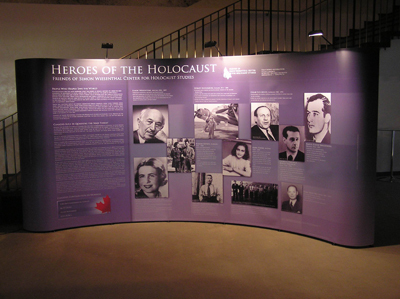 Heroes of the Holocaust profiles several figures who assisted Jews and gentiles escape the Nazis, who fought for the freedom of others, or dedicated their lives after the War to promote justice. We feel it is important that young children and adults alike will be able to identify with the heroes selected; countries represented include China, Japan, Poland and Denmark. The exhibit also details Canada’s role in the Allied Forces. Among the Heroes profiled is Canada’s most decorated WWII RCAF pilot, Sydney Shulemson. History of the Holocaust examines key events which led to both collective hate and bureaucratic mass murder. Included are a brief history of antisemitism, including the Nuremberg Laws; regional statistics re: population losses, and information about other groups targeted for elimination, such as Soviet POWs and homosexuals. Images include antisemitic propaganda, photos of key Nazi leaders, and selected views of death camps. There are no images which contain dead bodies, but there are two images of crowds of Jews being herded onto trains. 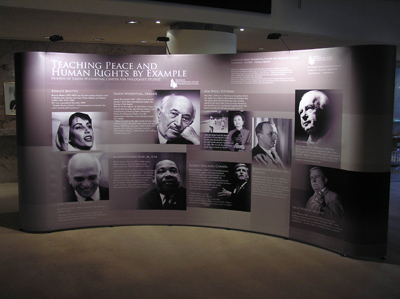 Teaching Peace and Human Rights by Example provides short biographies of several important figures who advanced the cause of human rights and peace-building. 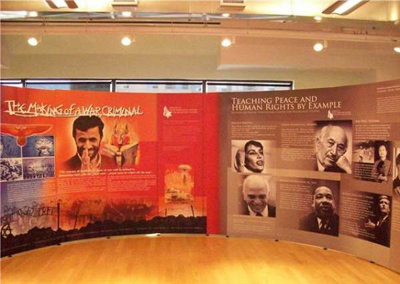 Figures included are Martin Luther King, Benazir Bhutto, Simon Wiesenthal, and Canada’s John Peters Humphrey. Whether these figures found their inspiration from the conflicts which engulfed their countries or in the desire to legislate change at an international level, the message to young students is both inspirational and leaves them curious. Making of a War Criminal compares Iran’s current President to the leader of Nazi Germany; its objective is to reinforce the consequences behind the actions of immoral, hate-promoting leaders. The central message is that history can repeat; the greater lesson is that as international citizens we must remember that being a passive bystander is unacceptable. 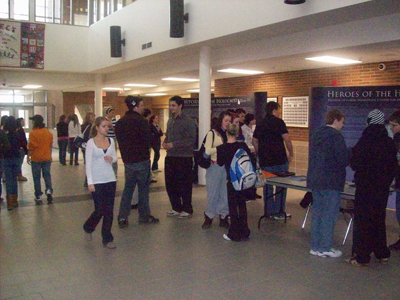 FSWC’s travelling education exhibits are on display at Stouffville District High School, November 12 – 14th. 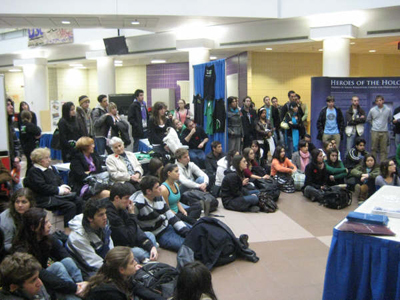 FSWC commemorated the 70th anniversary of Kristallnacht with students at the University of Western Ontario on Monday November 10th, 2008. The ceremony included presentations by Hillel, Students Taking Action Now: Darfur (STAND), and by keynote speaker Dr. Alain Goldschlager.